Asparagus is a hardy perennial that will last for 10-15 years in a well maintained patch. Choose a location with rich, well-drained soil, in full sun, apart from your annual vegetables so the soil won’t be disturbed every year. Prepare Soil - Since you are building a foundation for years of production, take the time to work the soil a foot and half to two feet deep, mixing in Cotton Burr Compost, Bone Meal and granular Gardener’s Special to improve the health and condition of your soil before planting, plus Cow Manure or Compost Chicken Manure. Planting Transplants (root crowns) - Asparagus can be planted in early spring (mid March to mid April) or in the fall (early October to mid November). Dig trenches 8 inches deep and 3 to 4 feet apart (asparagus roots spread wide). Spread some compost or manure in the bottom of the trench and cover with an inch of garden soil. Set the crowns 12-18 inches apart in the row, spread the roots so they lie flat and cover with 2 inches of soil. As the new shoots come up gradually fill the trench. Fertilizing - For high production and thick spears follow a twice-a-year feeding program. 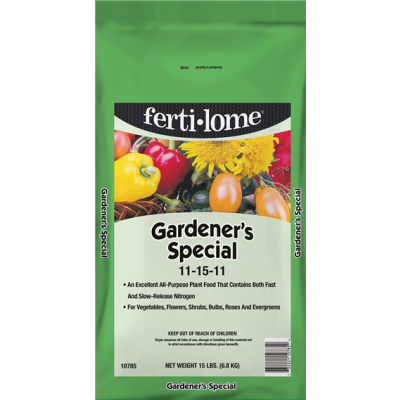 Make one application of ferti•lome Gardener’s Special (11-15-11) before growth starts in the spring and a second as soon as the harvest is finished to encourage heavy top growth. Don’t skimp on water when the top growth is developing. Spear production in the spring depends on vigorous growth the previous season. Harvesting - When spears are 6 to 8 inches high, snap off at the breaking point 1⁄2 - 3⁄4 inch above the soil level, or cut slightly below the soil level with a sharp knife. Do not harvest the first year. In subsequent years, harvest until the spear size decreases to thinner than a pencil, usually 6-7 weeks in a mature planting. Control weeds with mulching, hoeing, or spot chemical treatment. In the autumn, you can remove dead ferns after they are completely brown or leave them in place through the winter to catch moisture and prevent soil loss. Asparagus deteriorates rapidly after harvest. Store in a cold, moist location and use quickly. Fresh young asparagus is excellent raw in green salads or on a relish platter with a sour cream dip. This vegetable is delicious boiled or steamed, served with a sauce or by itself.